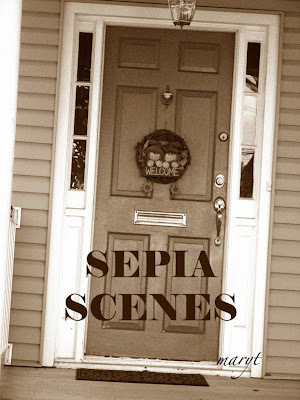 Hi again, it's Sepia Scenes day again! Over the weekend the girl across the street got married and she had a picture taking session in her front yard. This is one of the pictures I took and I thought doing it up in sepia would be pretty. I gave the photo a pink tone and blurred it once to soften it. 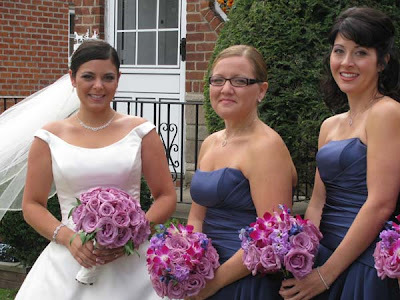 Here's the photo in color below just so you could see the color of the dresses she chose. The color is called "amethyst." I'm looking forward to your sepia posts! Don't forget to sign Mr. Linky and leave a comment. Spend a little time, won't you? visiting you fellow sepia sceners. Wonderful shots both of them but i really like the sepia one with it´s soft tone and feeling. The bride and her maids look så lovely and romantic in sepia. The dresses and the flowers are awsome. I think it would like fantastic in en sepiagrey tone and with the dresses and flowers in its own colour. This you could make with layers. Thanks for the work you do with this challenge! Sepia makes a wedding photo so timeless - as it should be. The sepia does give this photo a nice soft touch. I like it. The sepia and the softness definitely add to this. foto CHIP is right, the sepia makes it look so romantic. Number 52. Wow. Doesn't seem like a whole year does it? I remember issue #1. I was at the beach 3 1/2 hours away from my archives with no way to edit anything new and it was only by a stroke of luck I had an entry for it. Been a few lucky ones since then too now that I think of it. Pretty bride and her friends are lovely too. The sepia has a soft, romantic look. You could sit and look at a B&W or this case your sepia and not really be able to explain what it looked like. Today's photographer usually includes a soft focus black and white so your sepia choice is a perfect addition to these wedding shots. Lovely shots Mary - both of them! I love the sepia ! I really like the photo in sepia, Mary! The smiles are so pretty in either mode. The sepia tomes down the view nicely, the monochrome enhanced the bride. Nice! I am so glad you stay with us and keep the faith. the girls look lovely in sepia, makes the tones richer. Beautifully done and thanks for the tip again on how you did it. Mine is up now mary. Great shots!! They all look very happy and the bride is radiant! Have a great day! I'm sure she'll treasure the photo. I like it better than the original.